Once upon a time, there lived two kids on opposite sides of an ocean. Era uma vez um rapaz e uma rapariga que viviam em lados opostos do Atlântico. One kid, a boy, loved buildings and soccer; the other, a girl, loved music and dancing. They had little in common except that they had always felt a pull to get out of their small towns and see what else was out there. One day, each of these two kids was given the opportunity to leave the comfort of their hometown, families, and lifelong friends to move to a new country for a few months and see the world. O rapaz gostava de arquitectura e futebol, a rapariga gostava de música e dança. Tinham pouco em comum, a não ser o querer mais do que tinham - queriam experiências maiores do que as suas vidas em cidades pequenas. Um dia, a cada um deles foi dada a oportunidade de deixar o conforto da sua casa, família e amigos, para viver num país novo por uns meses e ver o mundo. Somehow, some way, each of those two kids, on opposite sides of the ocean with nothing in common chose the same city, made the same friends, and ended up at the same discoteca one cold night in March. Had they unknowingly spent their entire lives moving towards each other? Or had they simply tripped over the same loophole in time and space to end up in the same place? That’s unknown, but through a haze of tequila, Spanish dance music, smoke and hundreds of other scantily clad, attractive bodies, the boy locked eyes with the girl and they both smiled. De alguma forma, de alguma maneira estas duas crianças, em dois lados opostos do oceano, sem nada em comum, escolheram a mesma cidade, fizeram os mesmos amigos, e numa noite fria de Março foram à mesma discoteca. Teriam eles passado a vida inteira, sem saber, a caminhar um para o outro? Ou teriam simplesmente tropeçado no mesmo buraco no espaço e tempo para acabar no mesmo lugar? Não sabemos, mas por entre uma névoa de tequila, música espanhola, fumo, e centenas de outras pessoas atraentes, o rapaz fixou o olhar na rapariga e os dois sorriram. During the next 6 months, the boy and the girl definitely spread their wings and saw the world through the amazing international kids that had also joined them in that city. They traveled, partied, spent hours on the beach, and soaked up every single moment. They spent time together, but also spent plenty of time discovering things on their own. They moved in the same direction, then moved in opposite ones, then back in the same directions again. They kept finding themselves unexpectedly looking at each other in various moments, always with a smile on their faces. Durante os seis meses seguintes, o rapaz e a rapariga abriram as suas asas e viram o mundo através de todos os outros fantásticos jovens que se lhes tinham juntado naquela parte do mundo. Viajaram, festejaram, passaram horas na praia e absorveram cada um dos momentos que viveram. Passavam algum tempo juntos mas também passavam muito tempo separados, fazendo descobertas por si próprios. Andavam na mesma direcção, depois andavam em direcções diferentes, e depois de volta à mesma direcção. Encontravam-se sempre em momentos inesperados, olhando-se sempre com um sorriso na cara. At the end of those 6 months, the boy took the girl to the airport to send her back across the ocean. When the excitement of Erasmus hedonism, filled with new exotic people, endless nights out and skinny dipping in the Mediterranean had fallen away at the moment of good-bye, they were both startled to find that they were still side by side. They suddenly realized their wings had not only spread in the same direction, but had somehow become intertwined. Without either one realizing it as it had happened, they had become quite impossible to separate. Ao fim desses seis meses, o rapaz acompanhou a rapariga ate ao aeroporto para a ver partir de volta para o seu lado do oceano. Quando a excitação do hedonismo do Erasmus, cheio de pessoas exóticas e novas, noitadas, e a nadarem nuas no Mediterrâneo acabou, no momento da despedida, eles ficaram surpreendidos por ver que ainda estavam lado a lado. Eles aperceberam-se subitamente que as asas não se tinham apenas aberto na mesma direcção, mas que se tinham, de alguma forma, entrelaçado! Sem que nenhum se tivesse apercebido disso, tinha-se tornado impossível separarem-se. At the airport, the girl, hearing her name over the loud speaker for a final boarding call, took one last look at the boy, not knowing when she would see him again, painfully extracted herself, and boarded the plane back home. No aeroporto, a rapariga, ao ouvir o seu nome no altifalante para a última chamada para embarcar, olhou mais uma vez, a última vez, para o rapaz, sem saber quando o voltaria a ver. Ela, dolorosamente, saiu dos braços do rapaz e embarcou no avião de volta a casa. Except it wasn’t the end. This moment that seems like the end of the story wasn’t the end at all. It was actually the moment where it all began. Mas não era o fim. Aquele momento que parecia o fim da história não era, de forma alguma, o fim. Na realidade foi o momento em que tudo começou. That moment lead to two seemingly unending years of a long distance relationship. Aquele momento foi o início de 2 anos de relação à distância. 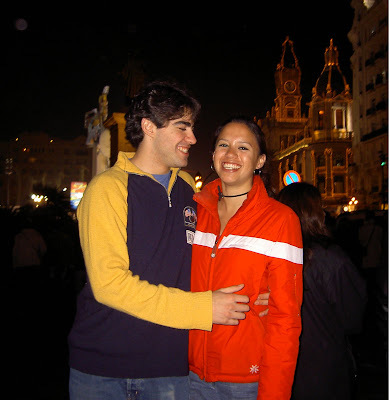 Then, two blissful years living together in Portugal. Depois, 2 anos felizes a viver juntos em Portugal. The wedding was wonderful. Sure there were moments of stressful, overseas planning, cultural misunderstandings, and last minute accommodations. But thanks to a lot of patience and support from my parents, aunts, and some fabulous wedding planners, the actual wedding went off amazingly. O casamento foi perfeito. Claro que houve momentos dificeis, com muito stress, mal-entendidos culturais e mudanças de última hora. Mas graças à muita paciência e apoio dos meus pais, tios, e fabulosos planeadores de casamento, o dia do casamento foi incrível. I would only change one thing for certain looking back, and this would be ensuring there were fans running in the sweltering church. As entertaining as it is to see grimaces of torture on the faces of our wedding guests in the video and to make fun of Sergio for the sweat/Tanduay rum running down his face as he said “I do”, I’m not sure if that was quite the sentiment we were going for. Mudava apenas uma coisa daquele dia – punha ventoinhas na sufocante igreja. Agora, quando vejo o vídeo do casamento, tem a sua piada ver as expressões dos convidados, que pareciam estar no Inferno, e a rir do Sérgio com suor/Tanduay (rum) a escorrer pelo lado da cara enquanto dizia o “Sim”, mas não era bem aquilo que pretendíamos! To summarize, there was a white dress, there were vows, kisses, and love aplenty. The reception had roasted pigs, toasts, awkward games, and dancing until sunrise. It was all lovely. Para resumir, havia um vestido branco, havia os votos, beijos, e muito amor. A recepção tinha “lechon” (leitão), brindes, estranhos jogos de salão e as pessoas dançaram até o nascer do sol. Foi adorável. But what sticks out in my head the most from that time was how touched I was by the village of Mactang, by my family, and neighbors who, even though they have SO MUCH LESS than we do, gave, gave, gave. People left their homes so that our guests could stay in relative comfort. Uncles stayed up during the night to man the generator so we could have electricity all night long. Our pre-wedding celebration the night before made us very happy as the entire village broke out into a fully choreographed ballroom dance routine, and then followed up with native dance performances. My aunts and cousins cooked up a storm to feed our guests with the best cuisine Mactang had to offer on the days before and after the wedding. My uncles and male cousins were more than happy to enfold Sergio, my brother and other guests into the Tanduay rum drinking circle, and gave them the fullest shots. Having a wedding in a place where there are no hotels, restaurants, running water, electricity or roads can certainly be a challenge. But lucky for us, we had a whole lot of hands to help us out. Mas a coisa mais importante para mim, que me deu mais felicidade do que tudo mais, foi como as pessoas de Mactang - a minha família, e vizinhos - apesar de terem muito menos do que nós, nos deram tanto. As pessoas deixaram as suas casas para os nossos convidados Americanos e Portugueses terem um sítio para dormir. Os meus tios ficavam acordados as noites inteiras de olho no gerador para nós simplesmente termos electricidade durante a noite. Na noite anterior ao casamento, a aldeia inteira preparou um espectáculo de dança só para nós e os nossos convidados. As minhas tias e primas cozinharam imenso, cada dia, para dar a melhor comida que Mactang podia oferecer. Os meus tios e primos acolheram de braços abertos o Sérgio, o meu irmão e outros convidados, iniciando-os, à maneira filipina, ao círculo da bebida, com shots de rum Tanduay. Ter um casamento num sítio onde não há hoteis, restaurantes, água corrente, electricidade ou estradas não e um desafio fácil. Mas, com muita sorte nossa, tivemos muitas mãos para nos ajudar. Boys, girls, and a small part of the people that couldn't fit in the church. Our joy was increased hundred-fold by the people around us, sharing in our joy too, making it happen. A nossa alegria foi aumentada 100 vezes por causa das pessoas à nossa volta nas Filipinas – partilhando a nossa alegria, e a fazer tudo acontecer! Which then led to this shift in heart and mind. Que depois levou a esta mudança no coração e mente. Que é onde estamos hoje. “There’s a kind of luck that’s not much more than being in the right place at the right time, a kind of inspiration that’s not much more than doing the right thing in the right way, and both only really happen to you when you empty your heart of ambition, purpose, and plan; when you give yourself, completely, to the golden, fate-filled moment.” Part 1, Chapter 5 (p. 119). I´m looking forward to our next adventures in the Philippines, i just hope we won´t have too much to go back to our own paradise, Mactang!! !